What is Bilingual Word Sketch? The Bilingual Word Sketch is an extension of the Word Sketch feature. It lets the user pick a word in one language and a translation into another language and compare how the words behave by observing collocates grouped into categories by grammatical relations. What is the Bilingual Word Sketch for? The list of collocates tell us whether the word and its translation share the same meaning in both languages or whether there are alterations or the words are completely different. In addition, the collocations will often be helpful when looking for a good translation of a collocation in the source language. 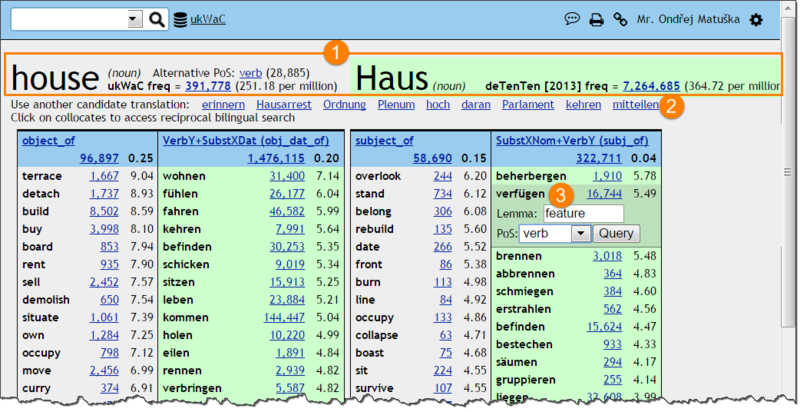 The example below shows a Bilingual Word Sketch for the English word house and its German translation Haus. Because the grammatical relations differ from language to language, comparison is limited to similar rather than identical grammatical categories. How to generate the Bilingual Word Sketch? Use the same procedure as with the Word Sketch. Log in to Sketch Engine (or click Home) and select a corpus. 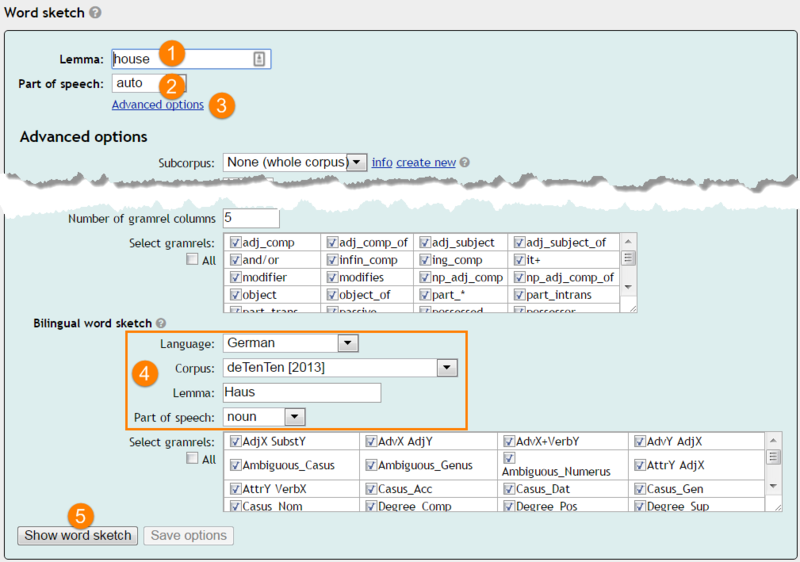 (4) select a language, a corpus, type a lemma and select a part of speech. You can also select or de-delect grammatical categories to be displayed. Click (5) to show the Bilingual Word Sketch. Collocates are grouped by grammatical relations and the frequency and score (the collocation strength) is shown. Click the underlined frequency next to each collocate to see a concordance with examples which will illustrate the type of grammatical relation. (3) click any of the collocates to display a search pop-up to generate a new Bilingual Word Sketch. It is necessary to type the translation of the collocate and select a PoS. Kovář, Vojtěch, Vít Baisa, and Miloš Jakubíček. Sketch Engine for bilingual lexicography. International Journal of Lexicography 29.3 (2016): 339-352. Vít Baisa, Miloš Jakubíček, Adam Kilgarriff, Vojtěch Kovář and Pavel Rychlý. Bilingual Word Sketches: the translate Button. In Proceedings of the 16th EURALEX International Congress. Bolzano, Italy, 15–19 July 2014, pp. 505–513. Adam Kilgarriff. Terminology finding, parallel corpora and bilingual word sketches in the Sketch Engine. In Proceedings ASLIB 35th Translating and the Computer Conference, London, May 2013, pp. 129–132.